There’s a lot to love about this latte. The spices add so much flavor, while the light milk helps keep it slim. This same sip at a coffee shop can run you more than four times the calories and seven times the amount of sugar. And need I even talk about the cash savings? 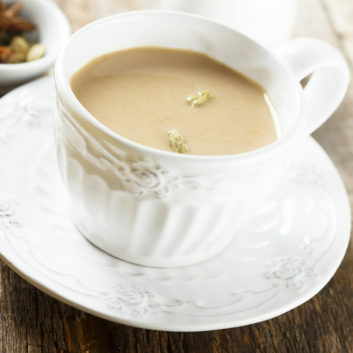 Brew it at home when you need a scrumptious and energy-boosting beverage. In a small pot, bring water and milk to boil. Add spices and allow to boil 1 minute. Add the tea bags, cover the pot and turn heat off. Allow to steep for 2 to 5 minutes. Discard tea bags. Pour the tea through a fine mesh strainer an d sweeten with honey or maple syrup to taste if desired.